Jessy enjoying her morning walk. Additional walks are available on request as an option. A view of the main yard. 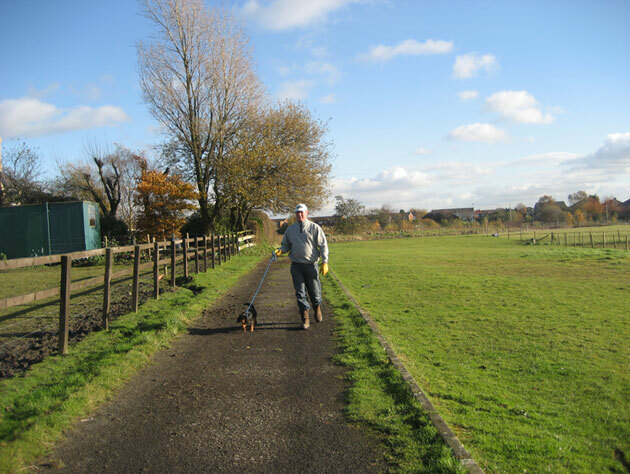 Each dog is walked individually on a lead daily, giving your dog plenty of fresh air, exercise and attention. You also have the option of a second walk a day in the afternoon (please see price list) if you prefer. The kennels are cleaned daily while your dog is on their morning walk and thoroughly disinfected between occupants. The units are heated during winter months and maintained to the highest standards. Food is included in the price, although you are welcome to bring your dog’s usual diet if you prefer. Fresh water is always available to your dog. We provide baskets and bowls for the duration of your pet’s stay. We also accept overnight and weekend stays depending on availability.